Just got back to Des Moines late last night. 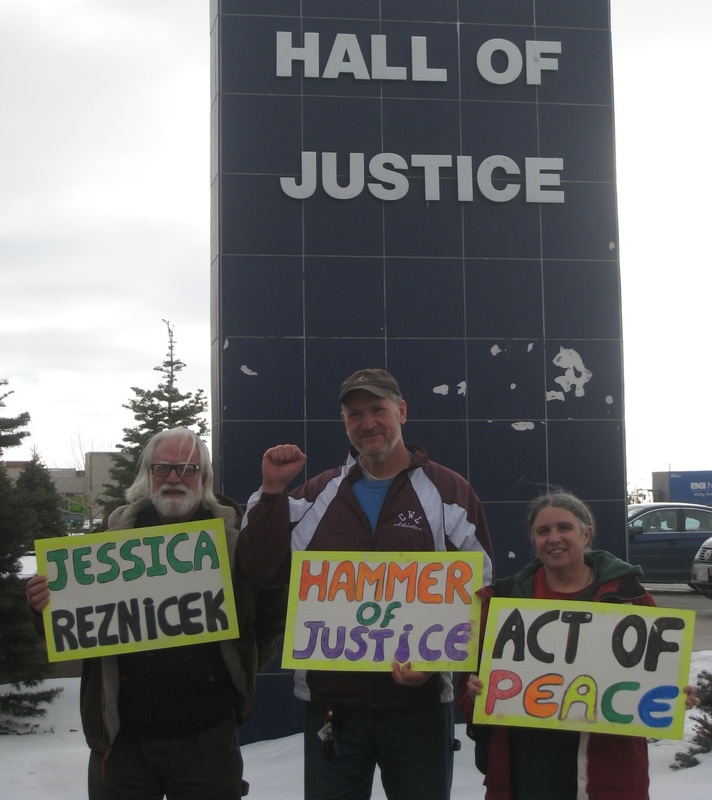 Jessica Reznicek, former Des Moines Catholic Worker, full time peace activist and friend and companion of the poor, did a direct disarmament action Witness for Peace at the Northrop Grumman building in Bellevue, Nebraska. 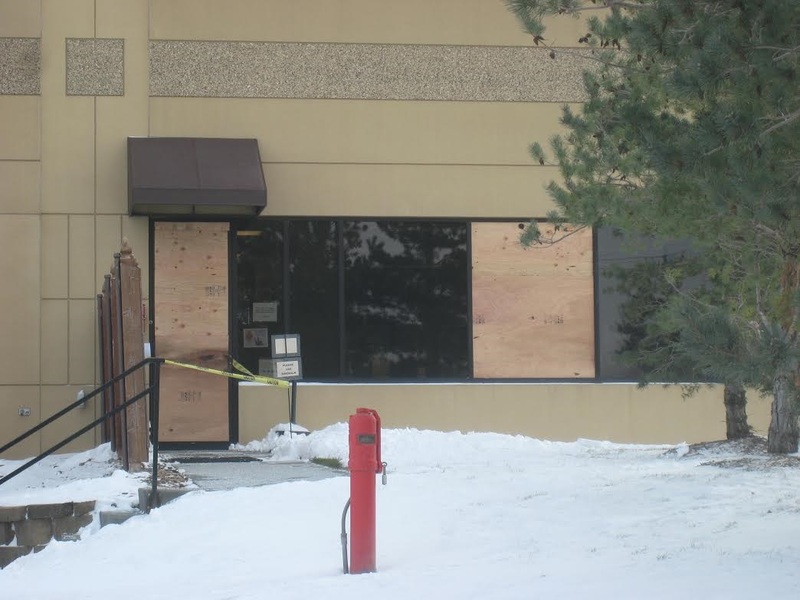 She took a sledge hammer and baseball bat to front windows and door of the Northrop Grumman building on Sunday night, December 27, 2015. 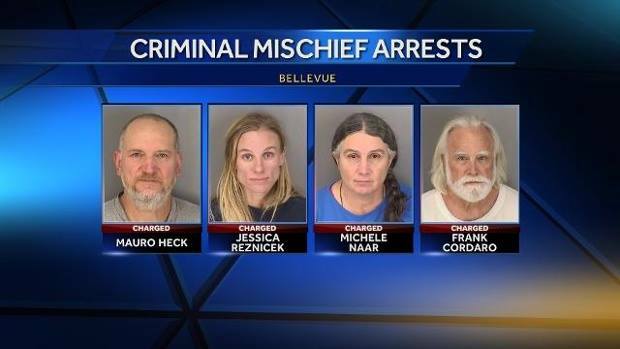 Jess was arrested by the Bellevue police and taken to the Sarpy County Jail. Mauro Heck, Michele Obed and Frank Cordaro were also arrested at the same time while they were attempting to leave the site on a frontal public road. We drove Jess to the site. We walked her onto the site. Mauro Heck took photos. We left the site as soon as Jess started her witness. We were arrested in Mauro’s van. Once in police custody it was obvious we were in the area as support for Jess. We spent the last two days in the Sarpy County Jail with Jess. Yesterday we were all charged with two felonies: criminal mischief $5000 or more and felony burglary in the Sarpy County Jail Court. Jess refused con. Mauro, Michele and I all accepted court appointed attorneys. Bail was set at $100,000 for Jess and $20,000 for Mauro, Michele and Frank. Mauro, Michele and Frank all made bail by posting 10% cash, $2000 apiece by the end of the day. Our next court date is a preliminary hearing for all four on January 26, 2016 at 1:30 p.m.
We are all aware that this is the beginning of a long legal journey for all four of us. And whatever legal course that Mauro, Michele and Frank choose to take, we do not want to distract from the message and witness that Jessica made at Northrop Grumman. In the days and weeks and months ahead we hope to amplify Jess’s message and witness. I talked to Jess this morning. Her spirits are good. And she is anxious to get her message out. We will be putting together a Jail/Court/Prison support network asap. We might even come up with a name for the campaign. For the time being, the message I wish to convey is “If witnessing the Witness is a crime, than I am Jessica Reznicek”. Thank you to all who are carrying me with them in heart and mind while I do this time here in Sarpy County Jail. It is felt deeply. My spirit is strong these days, and I attribute this to the kindness surrounding me. Mostly I am grateful just simply to be alive and well, swinging my hammer of justice at Northrup Grumman/STRATCOM (United Stated Strategic Command). I stand today with fierce conviction for the nonviolent direct action I have taken against the Northrup Grumman property in Bellevue, Nebraska on December 27, 2015. I broke two windows and a door window out of the Northrup Grumman building that night in an effort to expose the details of the defense contracts currently held by Northrup Grumman with STRATCOM at Offutt Air Force Base. Over the years, billions of taxpayer dollars are pouring into the hands of these money-hungry, bomb building, computer geek space war criminals. I want to say now that I truly believe that the American people are done with war – done funding, killing and dying in U.S.-led wars and terrorism – and are ready to pave a path to peace. Some folks, even personal friends of mine, are questioning my property destruction tactics at Northrup Grumman as one of a nonviolent nature. I refuse to delve too deeply into this conversation, for I believe the focus should rest primarily on Northrup Grumman and STRATCOM’s countless crimes against humanity. However, I will address a few small details of the events which occurred on the evening of December 27. Yes, glass did shatter. It shattered like the illusion that Northrup Grumman holds human life in any way in its best interest. It shattered like the illusion Iraq ever possessed weapons of mass destruction. It shattered like the illusion Iraqis were involved in 9/11. It shattered like the lie that perpetual war will ever bring peace. Glass shattered in the name of the hundreds of thousands of Iraqi lives taken when Northrup Grumman/STRATCOM’s direct bombs from space rained down upon them. I destroyed two windows and a door, yes! STRATCOM with its corporate partner Northrup Grumman destroys life in the tens of thousands. I did not swing my hammer blindly. Actually, quite the opposite. I swung only at windows whose blinds were pulled up, to ensure I would injure no one. Nor did I break either of the windows or door threatening a human being. When the police arrived, my arresting officer (who I ended up adoring and would love to grab a beer with when this is all said and done) found me kneeling in the main entrance of the Northrup Grumman building, with my empty hands raised above my head. He first asked me to lift my coat slowly to make sure I had no bombs strapped to me. I was eager to cooperate. I was not feeling threatened by him and I wanted to return the favor. I wanted to convey to him that I had love and respect for him as a fellow human being. Admittedly, however, I did shrug a little, considering the irony that Northrup Grumman has just recently been awarded a $55 billion contract to build a new long range U.S. bomber … and I am the one being checked for bombs. That all being said, I suppose that what I am trying to say is I acted in accordance with my conscience and my spirit, and that my property destruction was a useful form of nonviolent direct action. I do not stand in judgment of folks who feel uncomfortable using such methods. Nonetheless, I want to stand beside them, asking them to develop and apply their own means to expose the lies of Northrup Grumman and STRATCOM, be it through education, research, writing letters, public discussions, public vigils, rallies and marches and yes, even civil disobedience. Blood is pouring through the streets of many nations in the Middle East. People are dying all over the globe, masses of human beings are being dislocated, and the environment is under attack; all this through our U.S.-led global warmaking ways. There isn’t a continent on the planet free of a U.S military presence; there are U.S military bases in over a hundred countries. People all over the planet are resisting the U.S. global military presence in hundreds of places. I just returned from Jeju Island, where Catholics and South Korean peace activists are resisting a South Korean/U.S. Navy base being built there. We all have our part to play. Here in the heartland of America we who seek peace must make efforts to dismantle the U.S. military dominance of space from the top down, by publicly and nonviolently resisting the joint Northrup Grumman and STRATCOM missions. 6] – Are you interested in learning how to be a better advocate for things that you feel passionate about? If so, consider attending Casey Trees' Advocacy Workshop on Sat., Jan. 30 from 9 AM to 2:30 PM with breakfast & lunch provided at the Casey Trees office at 3030 12th St. NE, WDC 20017. The workshop is free and called, "Stand Up For Trees." You can register for the workshop at www.caseytrees.org. Offered twice yearly, Casey Trees' signature Stand Up For Trees course empowers participants with the tools and techniques necessary to stand up for D.C.'s trees. 7] – The Voice of a Community, Part II A Talk With Devin Allen and Fellow Activists is happening at the Reginald F. Lewis Museum, 830 East Pratt St., Baltimore 21202 on Sat., Jan. 30 from 1 to 5 PM. Call 443-263-1800 or go to www.rflmuseum.org. RSVP at https://www.eventbrite.com/e/the-voice-of-a-community-part-ii-a-talk-with-devin-allen-and-fellow-activists-registration-19965748090. The event is free with the purchase of a museum ticket. Meet Allen, the photographer whose photographs of the protests in Baltimore in spring 2015 went viral and ultimately graced the cover of TIME magazine in May 2015. The day will include a community forum dialoguing on the aftermath of the Baltimore uprising with Allen, JC Faulk, Micheal Wood, Kwame Rose and Tawanda Jones. Author and activist Kondwani Fidel performs a spoken word presentation. Augusta Fells Savage High School and Connextion High School also give live theatrical performances. There will be opportunities to explore Allen’s exhibit with the artist in a meet-and-greet following the performances. 8] – Come to a Coffee & Community Action: Young Souls Teach-in On Affordable Housing at The Potter's House, 1658 Columbia Rd. NW, WDC, on Sat., Jan. 30 from 2 to 3:30 PM. Organized by Young Souls’ Social Justice Task Force and the Washington Interfaith Network (WIN), this teach-in will focus on charting the power landscape of the DC affordable housing movement. Organizers with experience forming tenants' associations, fighting the Mayor on the housing budget, and driving coalition-building efforts will offer y'all ways to get engaged on this issue over the short- and long-term. Afterwards, grab a coffee and catch up with friends. Visit https://docs.google.com/forms/d/13UA3Hugej1C-EZ3ptHBnyas77IK77KyIvm1MGY_EIu4/viewform?c=0&w=1. 9] – On Sat., Jan. 30 at 5 PM come to Red Emma's Bookstore Coffeehouse, 30 W. North Ave., Baltimore 21201, hear “Be a voice, not an echo: A talk by Sharon Cooper.” This will be an intimate discussion with Sharon Cooper, sister of the late Sandra Bland as she shares her personal journey towards becoming a social activist in the wake of her sister's tragic, untimely death. Passionate about the empowerment of fellow citizens through mentorship and education, prepare yourself for an engaging conversation with Mrs. Cooper regarding current civil rights and social issues as well as how you can harness the power that lives within YOUR VOICE to address the ongoing racial inequities within minority communities specifically related to the deprivation of civil liberties and fundamental integrity. The talk is co-sponsored by UMBC and the Department of American Studies and doctoral program in Language, Literacy, and Culture. Call 443-602-7585. Go to http://www.redemmas.org. 10] – Usually, the Baltimore Ethical Society, 306 W. Franklin St., Suite 102, Baltimore 21201-4661, meets on Sundays, and generally there is a speaker and discussion from 10:30 AM to noon. On Jan. 31, the topic is “Mentoring Our Youth.” The UMB CURE Scholars Program is a groundbreaking program that prepares sixth- to 12th-grade students in Baltimore for competitive, lucrative, and rewarding research and health care careers at UMB and other health institutions in the region. What is the CURE Program? The National Cancer Institute’s (NCI) Continuing the Umbrella for Research Experiences (CURE) program was established by the NCI’s Center to Reduce Cancer Health Disparities (CRCHD) in 1999 to help support underrepresented students in biomedical research and career development. CURE utilizes a pipeline approach and provides career navigation, workforce training, and mentorship to diverse scholars at all stages of academic and career development. The CURE program is driven by a mission to build a diverse biomedical workforce, which is critical to addressing the health needs of all Americans and to eliminating cancer health disparities in the nation. Robin Saunders, EdD, MS, is the executive director of the UMB CURE (Continuing Umbrella of Research Experience) Scholars Program. She has worked in K-12 settings, community colleges, and comprehensive universities around the country. Most recently, she served at Kennesaw State University in Kennesaw, Ga., as program coordinator for the Master’s in Education program, departmental assessment coordinator, and assistant professor. She is originally from Columbia, Md., and earned both her master’s and doctorate degrees from Johns Hopkins University in educational leadership – teacher leadership development. Call 410-581-2322 or email ask@bmorethical.org. 11] – Playing for Life: Art Under Tyranny takes place at the Jewish Museum of Maryland, 15 Lloyd St., on Sun., Jan. 31 from 1 to 2:30 PM with Gail Prensky, Executive Producer, The Jüdische Kulturbund Project. Attendance to the Sadie B. Feldman Family Lecture is included with Museum admission. The Jewish Kulturbund was a cultural association of Jewish musicians and performing artists who survived Nazi Germany. This multimedia presentation features stories based on filmed interviews with members of this unique group plus other contemporary artists living around the world. We will explore the story of their heroic stands for artistic freedom and response to unjust control and repression. Through her Meteopa Productions, Gail produces independent projects focusing on advocacy, art, human rights, international, and music themes. She holds a Bachelor of General Studies from the University of Maryland and a Master’s of Science-Applied Art from the University of Wisconsin. Call 410-732-6400 or go to www.jewishmuseummd.org. 12] – On Sun., Jan. 31 from 3:30 to 6 PM, there is a Jews United for Justice Montgomery County Community Meeting at Ohr Kodesh Congregation, 8300 Meadowbrook Lane, Chevy Chase 20815. Some of the issues are guns, budget cuts, abusive scheduling practices, and expanding sick days to all of Maryland. Food will be provided. RSVP at http://org2.salsalabs.com/o/5483/p/salsa/event/common/public/?event_KEY=80485. 13] – Come to Busboys and Poets, 625 Monroe St. NE, WDC, on Sun., Jan. 31 at 6 PM for a panel discussion on Gentrification: The Good, The Bad, and the Incarcerated. Explore the intersection of gentrification, poverty, and the criminal justice system. The panel will feature activists, economic developers, and policy experts who will discuss the effects of gentrification on low-income communities. Following the panel discussion, attendees will participate in a design thinking exercise where they will generate innovative, tech-centered ways, to bring equitable and just development to our city. This event done in partnership with Busboys and Poets and is sponsored in part by Belnouvo, a company based the District’s 8th Ward. January’s forum will be recorded live as the first installment of the Capitol Innovation Podcast series. To purchase tickets and find more information about the panelists or the event generally, visit https://www.eventbrite.com/e/capitol-innovation-forum-the-good-the-bad-the-incarcerated-tickets-19893897182. 14] – On Sun., Jan. 31 from 3 to 4:15 PM, Rep. Elijah Cummings will speak at Homewood Friends Meeting House, 3107 N. Charles St., on the topic of “One Baltimore” and “What can concerned citizens do to make things better in Baltimore?" The event is free, and open to the public. There will be a Q & A. The talk is sponsored by Homewood Friends Meeting. Call 410-235-4438. 15] -- There is a weekly Pentagon Peace Vigil from 7 to 8 AM on Mondays, since 1987, outside the Pentagon Metro stop. The next vigil is Mon., Feb. 1, and it is sponsored by the Dorothy Day Catholic Worker. Email artlaffin@hotmail.com or call 202-882-9649. The vigil will be outside the Pentagon's south Metro entrance and in the designated "protest zone" behind bicycle fences across from the entrance to the Metro. By Metro, take Yellow Line and get out at the "Pentagon" stop. Do not go to the Pentagon City stop! Go up south escalators and turn left and walk across to protest area. By car from D.C. area, take 395 South and get off at Exit 8A-Pentagon South Parking. Take slight right onto S. Rotary Rd. at end of ramp and right on S. Fern St. Then take left onto Army Navy Dr. You can "pay to park" on Army Navy Dr., and there is meter parking one block on right on Eads St. Payment for both of these spots begin at 8 AM. No cameras are allowed on Pentagon grounds. Restrooms are located inside Marriott Residence Inn on corner of S. Fern and Army Navy Dr.
16] – The Marc Steiner Show airs Monday through Friday fr6m 10 AM to noon on WEAA 88.9 FM, The Voice of the Community, or online at www.weaa.org. The call-in number is 410-319-8888, and comments can also be sent by email to steinershow@gmail.com. All shows are also available as podcasts at www.steinershow.org. 17] – Go to the New Community Church, 614 S St. NW, WDC, on Mon., Feb. 1 from 6 to 7:30 PM for the ONE DC meeting. Engage with ONE DC’s work, whether it be through the People's Platform, the Black Workers Center, or one of the committees, such as Resource Development, Admin, or Community Learning & Member Development. Your talents and time are essential to make ONE DC a viable and powerful organization because of your direct involvement in the work. Member Orientation is designed to allow you to identify exactly what activities you want to devote your time and energy to, engage with staff and member-leaders, and join other members to keep the work strong and growing. Contact organizer@onedconline.org. 18] – On Mon., Feb. 1 at 6:30 PM, come to a meeting at 441 One Judiciary Square, WDC 20001. The Union Arts building at 411 New York Ave NE is the last collective art space of its kind in Washington, DC. It has been home to more than 100 artists and numerous organizations for many decades working as a catalyst of creativity for many communities throughout the city. Regrettably, the building was sold to development groups who plan to evict all – the resident artists and organizations – by September 1. They intend to build an 11-story luxury boutique arts hotel. The DBLee and Brook Rose development groups have enlisted Cultural DC to convert the now affordable and diversely accessible art space into a chic hotel, where only 7 art studios will be made available to no more than 20 artists. This is far fewer than the number of artist collectives currently working in the building, who after being displaced will then be forced to compete for studios at a significantly higher price. In addition, the new building will greatly alter the character of the area into another sterile development, not suited for creative inspiration. To find out more about the sale and what action you can take, visit https://www.facebook.com/events/232235183782617/. 19] – The Inter-American Commission of Women (CIW) will host a roundtable discussion that will focus on presenting a guide on policy reform related to women's incarceration for drug-related crimes at the Organization of American States, 17th St. and Constitution Ave. NW, WDC, on Tues., Feb. 2 from 10 AM to 1 PM. See https://www.eventbrite.com/e/women-drug-policies-and-incarceration-tickets-20700772568. 20] – Each Tuesday from 4:30 - 5:30 PM, the Catholic Peace Fellowship-Philadelphia for peace in Afghanistan and Iraq gathers at the Suburban Station, 16th St. & JFK Blvd., at the entrance to Tracks 3 and 4 on the mezzanine. The next vigil is Feb. 2. Call 215-426-0364. 21] – Vigil to say "No Drone Research at JHU" each Tuesday at 33rd & North Charles Sts. join this ongoing vigil on Feb. 2 from 5:30 to 6:30 PM. Call Max at 410-366-1637. 22] – Go to the African American Civil War Memorial and Museum, 1925 Vermont St. NW, WDC, on Tues., Feb. 2 from 6 to 8 PM and join DC Black History Celebration Committee & African/American Civil War Museum for DC Black History City-Wide Kickoff Program and Reception. Dr. Frank Smith will be the keynote speaker. This event is free and open to the public. Go to https://www.facebook.com/events/1000525560016735/. Call (202) 421-8608/(202) 667-2667. 23] – NIRS invites you to Paris and Onward: the Path Forward to a Nuclear-Free, Carbon-Free Energy Future, a Tele Briefing on Tues., Feb. 2 at 8 PM EST. This will be an inspiring discussion of the global climate agreement negotiated in Paris in December. Two acclaimed energy experts will explain what the climate agreement achieved and what its implications are for our energy future and nuclear power here in the U.S. Hear from Dr. Mark Jacobson, Stanford University; The Solutions Project (http://thesolutionsproject.org/) and Dr. Arjun Makhijani, Institute for Energy and Environmental Research (IEER.org). The moderator is Tim Judson, Executive Director, Nuclear Information and Resource Service. Register at http://org2.salsalabs.com/o/5502/p/salsa/event/common/public/?event_KEY=80620 to obtain call in details. 24] –There is usually a silent peace vigil on Fridays, from 5 to 6 PM, sponsored by Homewood Friends and Stony Run Meetings, outside the Homewood Friends Meetinghouse, 3107 N. Charles St. The next scheduled vigil is on Feb. 5. Black Lives Matter. Since this is a First Friday, there will be a potluck dinner afterwards, followed by a DVD showing. 25] – The Hiroshima-Nagasaki Commemoration Committee, Baltimore Quaker Peace and Justice Committee of Homewood and Stony Run Meetings and Chesapeake Physicians for Social Responsibility are continuing the FILM & SOCIAL CONSCIOUSNESS DVD SERIES. The DVDs will be shown at Homewood Friends Meetinghouse, 3107 N. Charles St., Baltimore 21218, usually on the First Friday. At 7:15 PM, from January through June, a DVD will be shown with a discussion to follow. There is no charge, and refreshments will be available. The series theme is CHANGE IS INEVITABLE. On Fri., Feb. 5 see BEYOND HATRED [France, 2007]. In September 2002, three skinheads were roaming a park in Rheims, France, looking to "do an Arab," when they settled for a gay man instead. Twenty-nine-year-old François Chenu fought back fiercely, but he was beaten unconscious and thrown into a river, where he drowned. The acclaimed French vérité documentary is the story of the crime's aftermath; above all, of the Chenu family's brave and heartrending struggle to seek justice while trying to make sense of such pointless violence and unbearable loss. With remarkable dignity, they fight to transcend hatred and the inevitable desire for revenge. Call 410-323-1607 or email mobuszewski [at] verizon.net. Seattle joins the growing list of cities in the American West that has slapped Monsanto with a PCB lawsuit. PCBs, or polychlorinated biphenyls, is a highly toxic chemical that the company manufactured decades ago. According to Seattlepi.com, the suit concerns PCB contamination in 20,000 acres that drain into the lower Duwamish, which is a federal Superfund site (meaning it’s so polluted that that the U.S. Environmental Protection Agency has to help with cleanup). It also concerns areas that drain to the East Waterway adjacent to Harbor Island, also a federal Superfund site. PCBs were detected in 75 percent of more than 1,000 samples collected from catch basins and drainage lines in the Lower Duwamish drainage area. In the East Waterway drainage areas, PCBs were detected in 82 percent of samples collected with “in-line grabs” of sediment in drainage pipes and PCBs were detected in 73 percent of samples collected from catch basins in street right-of-ways. The city is likely seeking millions of dollars from Monsanto to pay for the cleanup. “The ultimate cost depends on how far you go in cleanup,” Holmes told Seattlepi.com, adding that it would be “impossible” clean up all the PCBs found mainly in the city’s industrial zone. Under a consent decree issued by the Environmental Protection Agency (EPA) and the Washington Department of Ecology, Seattle already needs to spend at least $27 million to build a treatment plant to remove pollutants, including PCBs, from stormwater. However, as The Seattle Times pointed out, the plant will only cover a mere 1.25 percent of the 20,000 acres that drain to the Lower Duwamish. Monsanto has faced a spate of PCB contamination lawsuits over the decades and several this year alone. In 2015, the cities of Spokane, San Diego, San Jose and Oakland also sued the company over PCB-contaminated sites. Before switching to agribusiness, Monsanto was the primary manufacturer of PCBs in the U.S. from 1935 to 1979. PCBs, which were used to insulate electronics, was banned in 1979 by the U.S. EPA over human health and environmental concerns. The chemical has been detected in waterways around the world, and can cause damage to aquatic life, wildlife as well as human health. PCBs have been known to negatively effect the human immune, reproductive, nervous and endocrine systems, and cause cancer. In a 1970 internal memo, agrochemical giant Monsanto alerted its development committee to a problem: Polychlorinated Biphenyls—known as PCBs—had been shown to be a highly toxic pollutant. PCBs—sold under the common name Aroclor—were also huge business, raking in some $10 million in profits. Not wanting to lose all of these profits, Monsanto decided to continue its production of Aroclor while alerting its customers to its potentially adverse effects. Monsanto got out of the PCB business altogether in 1977—two years before the chemicals were banned by the EPA—but just because the company no longer produces the toxic substances doesn’t mean it can forget about them completely. 55] Do you need any book shelves? 42] – On Thurs., Jan. 28 at 6:30 PM at Dovecote Café, 2501 Madison Ave, hear the presentation Equal Justice Discussion: The Broken Bail System. "90% of Division Pretrial Detention budget goes to Baltimore’s Jail Facilities; 3.5% of spending goes to Pretrial Release Services program." - Justice Policy Institute 2011. Todd Oppenheim, an attorney in the Felony Trial Division of the Public Defender's Office for Baltimore City, and candidate for Circuit Court Judge will describe the bail review process, the first step in a long line of denying indigent defendants their rights. He will then show how pretrial incarceration due to high bails effects what happens during the life of cases (for representation, and the client's physical and mental states). From there, he will discuss how the resolution of a case is often determined by bail status. The discussion will focus on real examples of injustice that the general public doesn't always experience as well as possible solutions to the bail problem. The audience is encouraged to ask questions. The event is co-sponsored by the Maryland Chapter of the American Constitution Society. Go to https://www.acslaw.org/chapters/md/ma.... Visit www.toforjudge.com. 43] –Come to Luther Place, 1226 Vermont Ave. NW, WDC 20005, on Fri., Jan. 29 at 9 AM and through Sat., Jan. 30 at 4 PM for the Service to Justice Conference. This conference is a movement of Washington, DC social service organizations, impacted community members, and supportive institutions who recognize how the social service industry perpetuates the current arrangement of power that maintains systemic poverty and structural racism. The goals are to shift the content and development of programs, making them strengths-based, holistic, person-centered, and justice-oriented; restructure the organizations so that leadership and decisions come from the communities they serve; and prioritize advocacy work to create and implement policies that realign power and eradicate root causes of social inequity. The conference theme is "History of racism and its impact on the social services industry." Visit https://www.facebook.com/events/216866925314916/. 44] – Come to the 5th floor conference room, Wilson Center, Ronald Reagan Building and International Trade Center, One Woodrow Wilson Plaza, 1300 Pennsylvania Ave. NW, WDC, on Fri., Jan. 29 from noon to 1 PM to hear from David Greenberg, author, “Republic of Spin,” and Associate Professor of History and of Journalism & Media Studies, Rutgers University; former Fellow, Wilson Center; and Peter Baker, White House correspondent, New York Times; former Public Policy Fellow, Wilson Center. Presidential historian Greenberg recounts the rise of the White House spin machine, from Teddy Roosevelt to Barack Obama. His sweeping, startling narrative takes us behind the scenes to see how the tools and techniques of image making and message craft work. He also examines the profound debates citizens have waged over the effect of spin on our politics. Does spin help our leaders manipulate the citizenry? Or does it allow them to engage us more fully in the democratic project? RSVP at http://pages.wilsoncenter.org/01.29.16GreenbergBooklaunch_SpecialEventInvitation.html. Email wwics@wilsoncenter.org. 45] – On Fri., Jan. 29 from noon to 1 PM, join the Dorothy Day Catholic Worker in a vigil urging the powers that be to abolish war and torture, to disarm all weapons, to end indefinite detention, to close Guantanamo, to establish justice for all and help create the Beloved Community! This vigil will take place at the White House, 1600 Pennsylvania Ave. NW. Contract Art @ artlaffin@hotmail.com or at 202-360-6416. 46] – On Fri., Jan. 29 from noon to 1 PM, join Women in Black peace vigil. This vigil will take place at the corner of Light and Pratt Sts. Stay for as long as you can. Wear black. Dress for who knows what kind of weather. Bring your own poster or help with the "NO WAR IN MY NAME" banner. When there are others to stand with, you don't need to carry the burden alone. Do this to be in solidarity with others....when everything around us says, Be afraid of the stranger. 47] – The BALTIMORE FREE FARM is holding its 5TH ANNUAL FANCY DINNER FUNDRAISER on Fri., Jan. 29 at 5 PM at 2640 Space, 27th & St. Paul Sts. Enjoy food, fun, and music! Come out and help support Baltimore Free Farm and enjoy a home cooked meal while doing so--vegan and gluten free options. Tickets are on a sliding scale donations. Large donation tickets of $70 or more will receive special thank you gift bag of awesome BFF merchandise! There will also be a raffle and a silent auction! Lots of great prizes! Go to http://www.baltimorefreefarm.org/2015/12/14/fancydinner/. 48] –There is usually a silent peace vigil on Fridays, from 5 to 6 PM, sponsored by Homewood Friends and Stony Run Meetings, outside the Homewood Friends Meetinghouse, 3107 N. Charles St. The next scheduled vigil is on Jan. 29. Black Lives Matter. 49] – There is an opportunity to participate in ballroom dancing, usually every Friday of the month, in the JHU ROTC Bldg. at 8 PM. Turn south on San Martin Dr. from the intersection of Univ. Parkway and 39th St. Drive on campus by taking the third left turn. The next dance will be Jan. 29. Call Dave Greene at 410-599-3725. 50] – Get a Little Friends For Peace Academy Certification on Sat., Jan. 30 or Sat., Feb. 20 from 10 AM to 2:30 PM at 128 M St. NW, WDC. Come to learn and develop conflict-resolution skills. Earn a Continuing Education Unit (CEU) for each session. The cost is $45/person per session, and free for volunteer teachers. Need based financial assistance and student rates are available for all courses! Contact M.J. Park at mjpeace@gmail.com. To register, contact MJ Park @ 240-838-4549 or mjpeace@gmail.com. Visit http://www.lffp.org/peace-academy.html. 51] – Chesapeake Physicians for Social Responsibility is recruiting for this year's polar bear plunge on Sat., Jan. 30 from 10:30 AM to 2 PM at the National Harbor. Would you like to join Team Chesapeake PSR? It is a great way to support Chesapeake PSR and CCAN, and it is a really fun event. What greater way to bond with your fellow activists then to jump in a cold river and gather for warm drinks afterwards. Sign up at http://chesapeakeclimate.org/event/11th-annual-polar-bear-plunge/. Call PSR at 240-246-4492 (cell). 52] – Each Saturday, 11 AM – 1 PM, Chester County Peace Movement holds a peace vigil in West Chester in front of the Chester County Courthouse, High & Market Sts. Go to www.ccpeace.org. Email ccpeacemovement@aol.com. 54] -- If you would like to get rid of books, videos, DVDs or records, contact Max at 410-366-1637 or mobuszewski at verizon.net. 55] -- Can you use any book shelves? Contact Max at 410-366-1637 or mobuszewski at verizon.net. 56] -- Join an extraordinary global campaign for the elimination of nuclear weapons: http://www.globalzero.org/sign-declaration. A growing group of leaders around the world is calling for the elimination of nuclear weapons and a majority of the global public agrees. This is an historic window of opportunity. With momentum already building in favor of Zero, a major show of support from people around the world could tip the balance. When it comes to nuclear weapons, one is one too many. 57] – A Peace Park Antinuclear Vigil takes place every day in Lafayette Park, 1601 Pennsylvania Ave. NW, 24 hours a day, since June 3, 1981. Go to http://prop1.org; call 202-682-4282. The government refused to help with the burial of 49 of the victims of the 1982 massacre. Guatemalans held a funeral march Saturday for 49 victims of a massacre committed by the Guatemalan army 33 years ago, teleSUR correspondent Santiago Boton reports. Survivors of the massacre, committed under the dictatorship of Gen. Efrain Rios Montt, carried coffins with the remains along a main road of a remote community in Huehuetenango state. ”This is where the massacre was, this is where they burnt all the homes, where they shot everyone,” Mateo de Mateo Pedro, of the victims’ committee, told teleSUR, standing in an area that is now dirt paths and lush green forest. “I saw with my own eyes, then a nine-year-old child, the army massacring children, accusing them of being guerillas, cutting off their head and sucking their blood in order to create psychological panic within the community. They raped women in front of their husbands, as punishment, as psychological torture. In a field near here, they played ball with the heads of the dead,” the protected witness, whose identity can’t be revealed, stated. In total, 74 people were killed that day and the next in the community, with scientific studies carried out by the Forensic Anthropological Foundation supporting survivors’ testimonies. “We’ve recovered (the remains of) at least 49 individuals, but the problem is that we don’t have complete bones … we have a piece of skull, a piece of a femur, a bit of rib, and so on,” explained Jose Suasnavar, from the foundation. Although the remains were exhumed in 2009, it has taken this long to carry out a burial, according to the families, because the Guatemalan government has refused to fulfill its responsibility to give the victims dignity. Instead, the International Red Cross has helped the families out. The Guatemalan civil war begun in 1960 and lasted 36 years. The government waged war on various leftist groups that were mainly supported by Mayan indigenous people and by campesinos. The End of Impunity in El Salvador?